An error occurred while attempting to checkpoint the selected virtual machines. Checkpoint operation failed. cannot create the checkpoint. 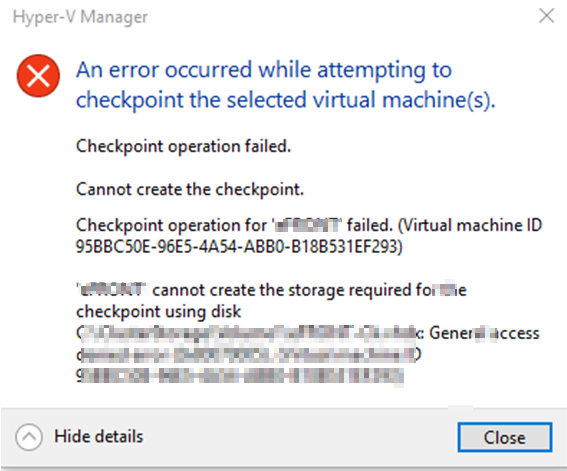 The reason you might be getting this error is because your disk drives for this VM are at the root of the drive. C:clusterstoragevolume1 for example. what you need to do is move the drives of this VM to a different folder deeper than that path. C:clusterstoragevolume1myvm for example. recreate the VM if necessary, and point the drive location to the new path. after than you should be able to do the checkpoint fine.